Istria is indeed a feast for the eyes. Its streams flow to the sea through deep valleys and gullies. Istria is a perfect mix of continental Croatia and the Adriatic Sea. The peninsula has a beautiful seaside with rocky beaches and clean sea. There are many secluded beaches and places to go if you want a more romantic, private atmosphere. The valleys and rolling hills fill the interior of Istria. This is where all the top-rated olive oils, prime white truffles and award-winning wines come from. Istria was a part of the Roman empire, which guarantees a rich historic background accompanied with beautiful architecture and monuments. It's the perfect location for our tennis holiday. Porec is a city on the western coast of Istria. After Pula, it’s the biggest Istrian city. The city was inhabited even in ancient times; the walls around the city were built during the Roman period. The town is almost 2,000 years old, and is set around a harbour protected from the sea by the small island of Sveti Nikola/San Nicola (Saint Nicholas). 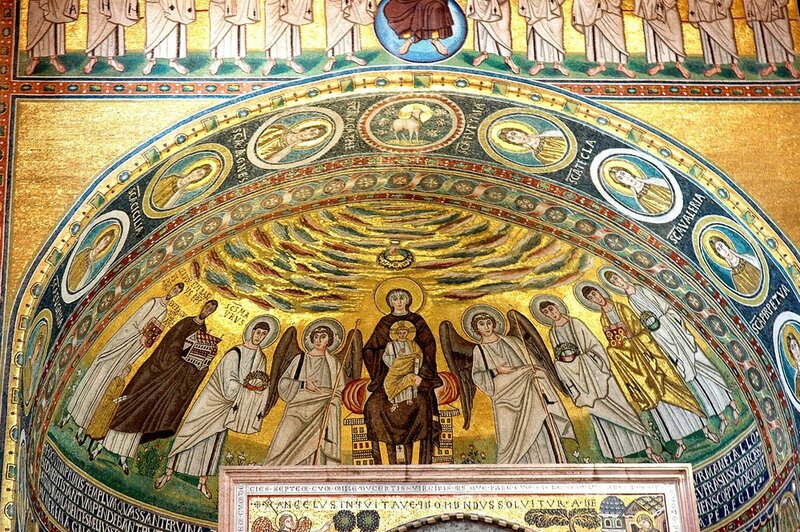 Euphrasius basilica - The most valuable cultural monument in Porec. It was built on the remains of an earlier tri-naval basilica, in the first half of the 6th century, during the period of Bishop Euphrasius, whose name it bears. The complex of the Euphrasian Basilica represents a significant global monument acknowledged by UNESCO organisation in the year 1997. Architectural and historical heaven, Pula holds most of the preserved Roman monuments and buildings in Istria. Its most famous attraction, the well preserved Roman amphitheater, is one of the most famous sights in the whole of Croatia. The Brijuni islands are a collection of fourteen islands and islets in Istria off the northern part of the Croatian coast. All of the islands together comprise one of Croatia’s eight wonderful national parks. There are numerous archaeological sites with Roman remains on the Brijuni Islands. In those times Brijuni belonged to only one owner whose economic basis was the commercial production of salt and building stone at the local quarry.